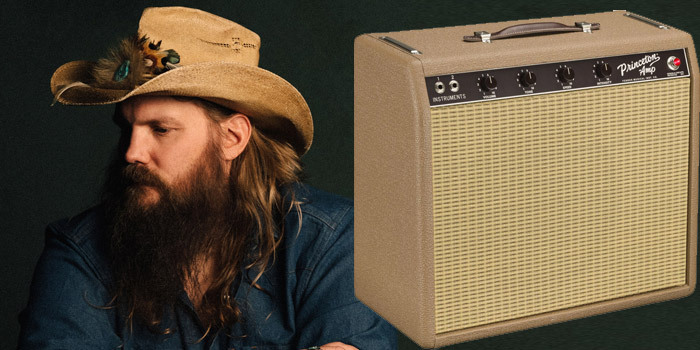 Fender Musical Instruments Corporation has unveiled the all-new Fender ’62 Princeton Chris Stapleton Edition amplifier. Available for purchase beginning this week at local dealers and on Fender.com, this amplifier release is Fender’s first Artist Signature Amplifier collaboration in the country music space. As part of the collaboration, Stapleton personally requested all artist royalties be donated to his charity, Outlaw State of Kind (OSOK). OSOK is Chris and Morgane Stapleton’s charitable fund that supports a variety of causes that are close to their heart. The Outlaw State of Kind Fund was founded in 2016 and is administered by the Community Foundation of Middle Tennessee. The brown ’62 Princeton amp’s sensitivity and smooth organic tremolo made it a long-time studio favorite and the ideal partner for Grammy-winning country artist Chris Stapleton. During Stapleton’s early touring days, he discovered a modified ’62 Princeton amp and instantly fell in love with the sound and the versatility. Fender set out to recreate and revamp Stapleton’s favorite amplifier not just cosmetically, but also internally and sonically, all kept to the specs of his original find. Chris Stapleton’s take on the iconic Princeton amp keeps the old-time charm with upgraded technology. The hand-wired Fender ’62 Princeton Amp Chris Stapleton Edition boasts the classic Fender ’62 Princeton 6G2 amp circuit and comes enhanced with Stapleton’s favorite features and personally-chosen artful touches: Fender Vintage “Blue” tone caps; Schumacher transformers; an upgraded Eminence 12″ Special Design “CS” speaker; output tube-biased tremolo circuit; and an engraved brass plate with Chris Stapleton’s signature. The acoustically resonant solid pine cabinet wears a rough brown textured vinyl covering, a wheat grille cloth and a thick dark brown leather handle, while the mahogany control panel sports dark brown “radio” knobs. The amp also features a retro-styled Filson Rugged Twill fabric cover. Rugged Twill is preferred for its durability and dependability in the field. The 22-oz. cotton industrial twill is lightly brushed with wax to repel water and densely woven to reduce snags and tears. All Rugged Twill amp covers were sewn in Seattle, Wash.